Essendon has won their fourth consecutive game with a convincing 43 point win over Sandringham at Trevor Barker Oval on Saturday afternoon. Ben Howlett (37 disposals) and Tayte Pears (32) were instrumental in the Bombers win after being dropped from the AFL side ahead of the match against Collingwood on Sunday. Captain Ben Duscher was a standout as he continued his strong form booting five goals to go along with 25 disposals. A four goal to one opening quarter set up the win for the red and black as they continue their surge towards a top eight finish. It was the experienced bodies that shone through with Howlett, Pears and Nathan Lovett-Murray (31 disposals) clearly outmuscling their younger opponents. Joe Daniher was held goalless but provided an important target all day as did Stewart Crameri who booted just the one major. Alwyn Davey’s pressure across the forward line was once again instrumental, the speedy forward finishing the match with a bag of three. 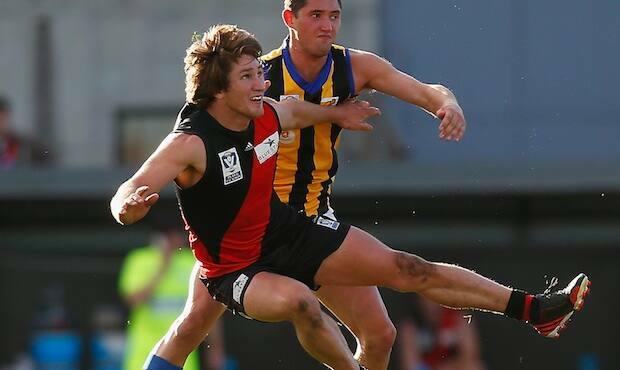 The Bombers face Box Hill next Saturday afternoon at Box Hill City Oval. Goals: Duscher 5, Davey 3, Firman 3, Lovett-Murray, Hille, P. Ambrose, Crameri, Z. O’Brien. Best: Duscher, Howlett, Davey, Lovett-Murray, Pears, Firman.